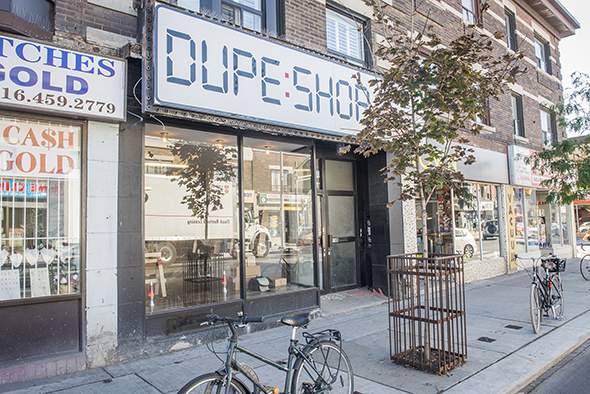 Dupe Shop is Toronto's cassette store and analog emporium. 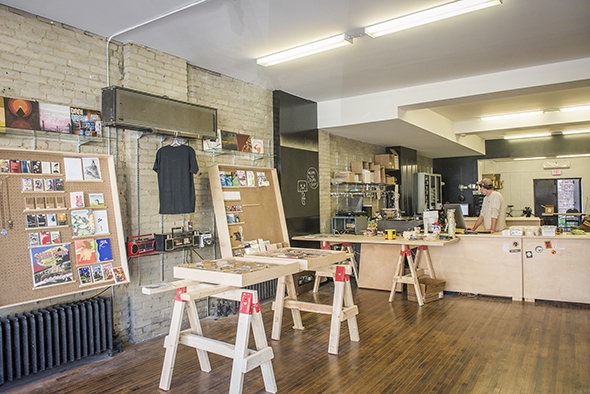 It's the physical outpost of duplication.ca , the Toronto/Montreal wholesale analog duplicator. 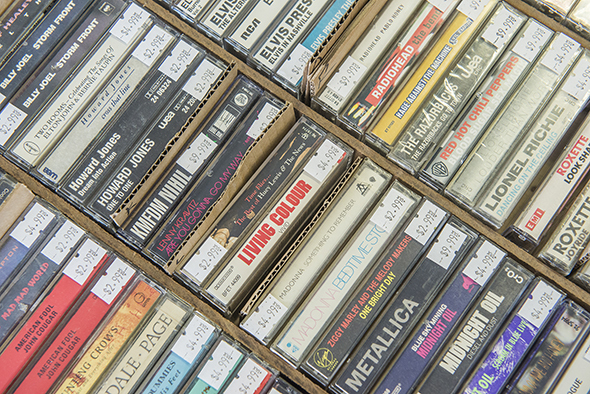 They'll make copies of CDs, VHS, tapes, and more for just about anybody. That means you can walk in with a single copy of a DVD and make a copy for a friend, or as a small record label you could come here to print hundreds of copies of records, cassettes, or CDs for multiple bands on the label. Equipment in the store presses vinyl LPs, and they even have a lathe cutting machine to create plastic records. 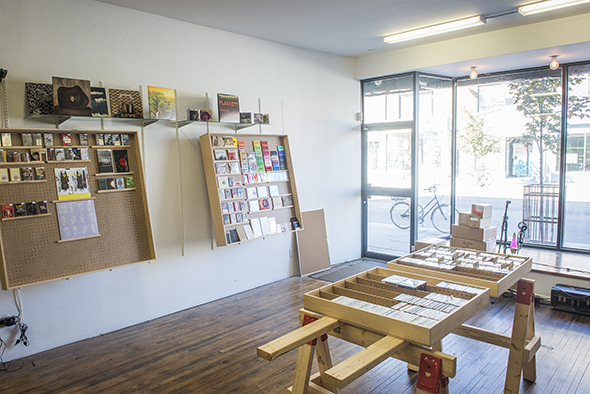 The semi-empty industrial DIY feel fits with the nature of the space, tapes resting in the centre on a big sawhorse. The emptiness could be good for shows, though, as there's a small stage in the window. They record shows and interviews here too, throwing them up on the internet. 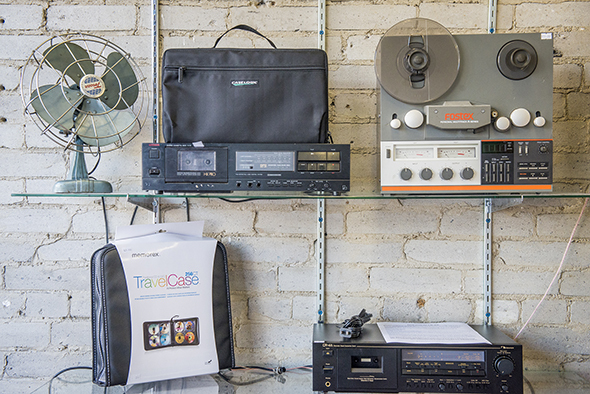 Several peg board displays show off various aspects of the shop: this one shows off all the varieties of colours and types of cassette tapes you could get for your music. Dupe Shop definitely realizes that style is a huge factor in marketing your band, and will help you with the physical duplication of the recordings up to the printing and packaging of the final product. A lot of the tapes on the sawhorse display are used, but the selection is curated unlike the Value Village up the street. For example, there's an awesome entirely indigenous section of tapes. A lot of the tapes are used, but some are thrifted still in their packaging. They also sell cassettes they've helped make for bands, and sometimes bring in stuff they're particularly interested in. 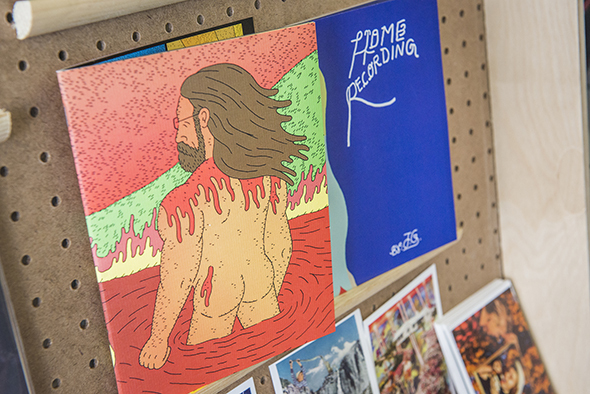 They also have zines and small books on display as well as postcards of collages by a Dupe Shop employee. Get lost in something like Justin Gordon's Home Recording , a book of elegant but trippy line drawings ($15) put out by Toronto-based Swimmers Group . 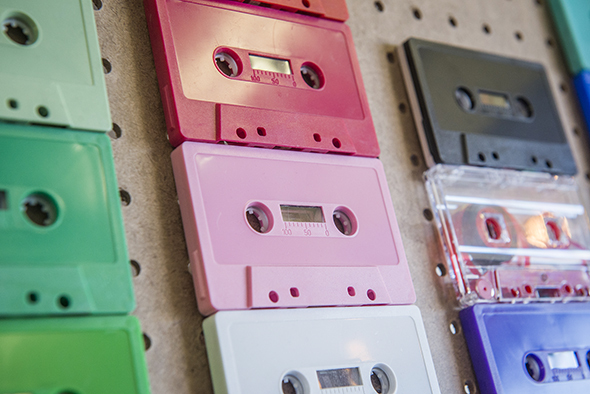 What good are tapes if you've got nothing to play them with? They've got good boom boxes for a hundred dollars, one of which plays Kylie Minogue while I'm there. You can even get a walkman for $19.99, batteries included!